Finally, I give you the long awaited KIKO make up review! Without boring you to death I must just reiterate that my absence from the blogosphere (which most probably went almost completely unnoticed) was due to the fact that I have spent the last two months in the law library revising for my second year exams; which I may add was stupendously boring. My mother and older sister went to Rome in April, (yes that's how long I've been waiting to post this!) 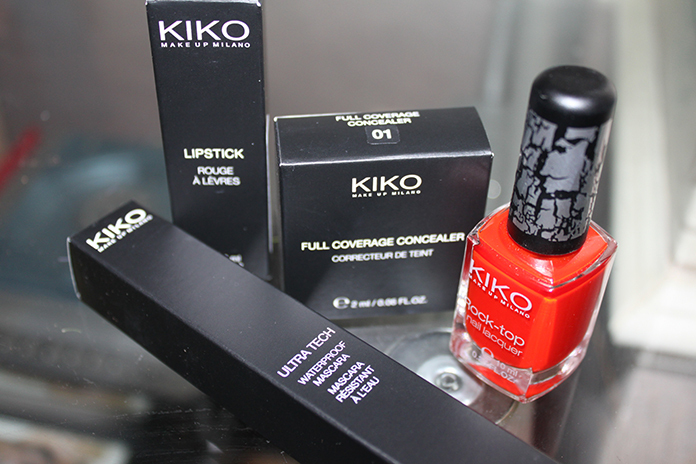 I asked them to get me a selection of items from the KIKO Make up Milano range. I first stumbled upon this brand whilst on holiday in Sicily last year when I was desperate to get my hands on a decent waterproof mascara after forgetting to pack mine. I bought the 'Ultra Tech' waterproof mascara that is featured in this post and was pleasantly surprised by it's quality, especially coupled with it's rather cheap price tag! I was so impressed that I wanted to try more of their products and didn't realise that they now have a shop here in London, which I will be visiting often now I'm in the know! Now I was rather sceptical to try any concealer other than MAC Studio Finish which I have been using for years now but, at almost £15 a pop I was keen to try an alternative. I have to say KIKO's Full Coverage Concealer is a close contender for the title of best concealer and it's a steal at half the price of MAC's coming in at just £7.50. 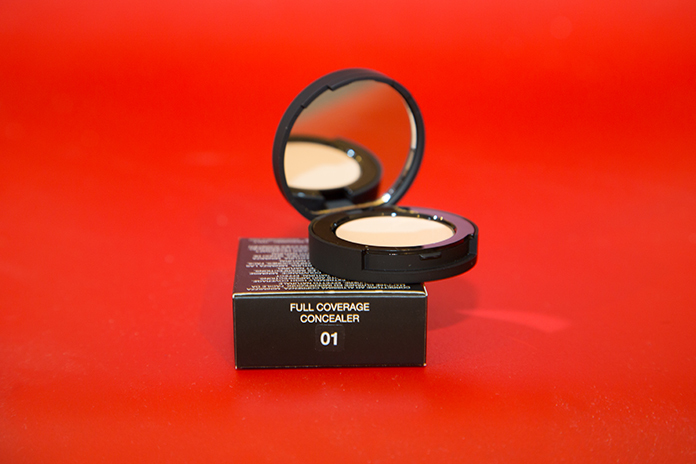 As the name may give away it's a pretty dense concealer but believe you me I NEED IT! Despite being twenty it seems my skin has yet to realise I'm no longer a teenager and I still get quite a few spots, I also have red marks from old spots as my skin is quite sensitive. I find this concealer does the job of hiding them pretty well although I must say MAC Studio Finish is still my favourite, it has a little more staying power than the KIKO alternative. This is the Ultra Tech waterproof mascara I mentioned earlier, it's £7.50 to buy here in the UK although I recall paying a lot less in Italy, as is the case for many of the other products. I'd recommend if you are planning a trip to Italy, to wait it out and stock up over there. Although I am extremely fussy with my mascaras, usually opting for Clinique's High Lengths mascara which has a comb applicator which I prefer as I feel it allows for a much more natural look. I'm not a fan of clumpy over applied mascara I like to try and define every individual lash. Although KIKO's mascara didn't come with my preferred applicator, it was fine for a quick holiday fix. It done what it was meant to and didn't budge from beach to evening. Whenever I need to use waterproof mascara when I'm at home I sometimes swap applicators with my Clinique one to get my desired look. Overall however despite my picky taste with regards to applicators this was a good all round mascara and did what what it says on the tin, it was most certainly waterproof. This Rock Top nail lacquer gives Barry M's Instant Nail Effects Crackle a run for it's money and it's now on sale for ONE POUND! Sadly they don't have this shade in stock online but ANY colour is a steal at £1, right!? As I said in previous posts I'm not really a fan of lipsticks often opting for lip tints instead (for my review on Benfit's 'benetint' click here). However I've yet to find a lip tint that gives a luscious red tone, it's something you can only really create properly with a lipstick. 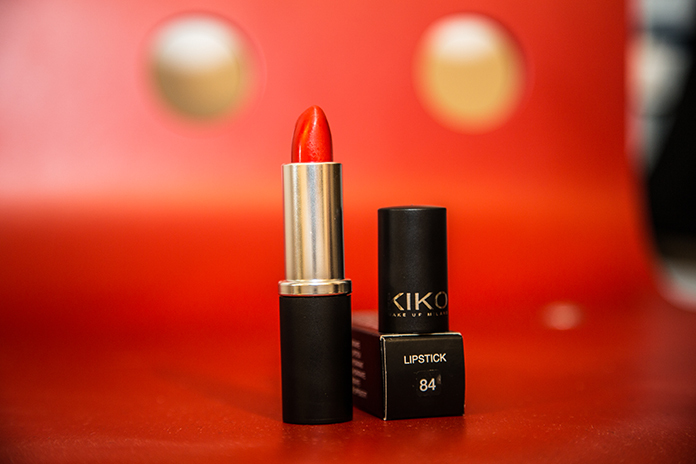 This is KIKO's Smart Lipstick in '84 Red' and it has almost converted me to a avid lipstick user! It stays on for absolutely HOURS and creates the perfect sultry red lip! (Did I mention it's also only £2.50!!) I didn't take any pictures of it on when I took these photos as I had the most horrendous spots, however I wore it to a Dior event some time after and there will be plenty of professionally taken pictures of me wearing it that night in a blogpost to follow. 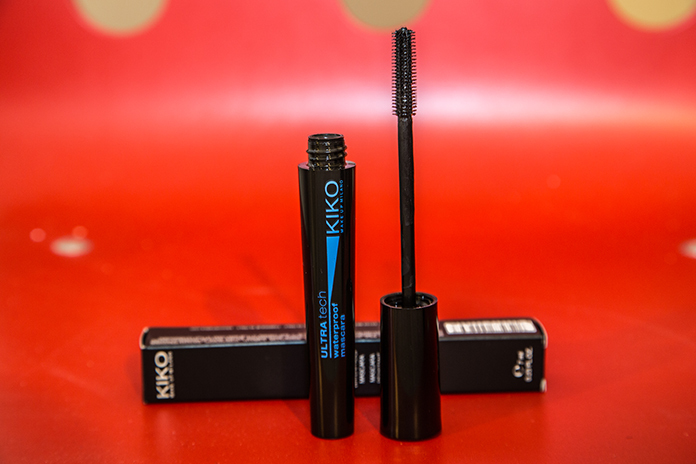 That's all for now folks, get down to a KIKO store ASAP, there are two in London at both Westfield Stratford and Westfield White City.